This second instalment in Frankfurt Opera's new Ring Cycle has some high expectations to meet. The Rhinegold that was released earlier this year is a very fine recording indeed, with excellent sound engineering, uniformly fine singing and a really distinctive interpretive approach from Sebastian Weigle (read my review here). 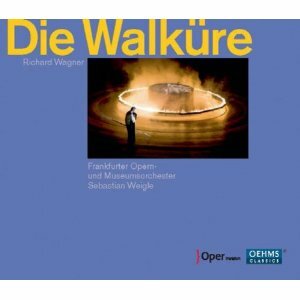 Die Walküre poses different, and in many respects, greater challenges, at least from a musical point of view. Ensemble is the key in Rhinegold, but Walküre relies on exceptional solo singing from the leads. This it gets, although while all the singers are good, one or two of them really stand out. But, as with the previous Rhinegold recording, what really makes this Walküre distinctive is the contribution of conductor Sebastian Weigle. His patience with this music is wonderful. He knows that Wagner doesn't need any help in building up his climaxes or creating the drama that the story needs. So tempos are usually steady, and build-ups are achieved through dynamics and orchestral colour rather than accelerando. At the start, the storm is raging in the orchestra, but it is not an all-out assault from the orchestral forces, instead it is menacing, with a steady pace and moderate dynamics. Weigle gets all the drama he needs from the tone of the orchestra and the carefully graded articulations. Similarly, The Ride of the Valkyries achieves a continuous sense of ecstatic power, but without excesses of tempo or dynamics. Weigle never seems to exert too much control over the proceedings. He keeps the orchestra tightly synchronised, but the singers do occasionally enter ahead or behind his beat. The music doesn't suffer, in fact it adds to the sense of theatre. In a time when audio recordings of staged Wagner operas are rapidly losing ground to those of concert performances, the feeling of actually being in the theatre is a valuable asset, and this recording really gives you that sense. The sound recording plays an important part in this effect. Somehow, the team manages to give the singers a sense of placement on the stage, but without any of them actually sounding distant. A subtle use of the stereo array is a key to this I suspect. Almost every new recording of Wagner these days, be it audio or video, has both a surround and stereo mix, and the stereo usually comes out as a second best. But here it is used to ideal effect. The balance between the pit and the stage is ideal. The tone of the string section can sometimes sound a little dull, but the woodwind and brass are crisp and vibrant throughout. Weigle often gets a real bite out of the brass, a tone that has volume but also has edge. That is a real strength of this orchestra, and comes over well in the recording. Among the singers, the real standout performance is from Eva-Maria Westbroek as Sieglinde. She has got everything this part needs: warmth, passion, humanity – and of course precision and stamina. Over the last couple of years, Westbroek has been singing the role in houses around Europe, and receiving acclaim for it everywhere. She has already recorded it twice, at Bayreuth and with the Berlin Philharmonic, but even so, her performance here alone is worth buying the set for. And Frank van Aken is the ideal partner for her as Siegmund. The two are in fact husband and wife, and their musical interaction is spectacular. Westbroek has an open, powerful sound, which she mediates with controlled but never excessive vibrato. van Aken gives pretty much exactly the same sound but an octave lower. And he too has the power, control and stamina to ensure that every phrase is ideally presented. Terje Stensvold is an effective Wotan, but not a particularly loud one. He brings gravitas to the role, mainly through the richness of his tone. He sings the lower notes like a true bass, but brings that bass richness to the upper notes as well. Martina Dike is appropriately stern and disciplined as Fricka. Her singing has an almost Baroque sensibility, and you could almost imagine her singing Bach cantatas in this style, albeit under 1950s performance conventions. But again, chemistry is the secret to her success, and she provides an excellent complement of Stensvold, with a similar sense of drama in her voice but a similar moderation to her dynamics. The one voice in the cast that I have reservations about is Susan Bullock as Brünnhilde. She too is a seasoned Wagnerian, and is much acclaimed around the world for her interpretation of the role. Some of her singing here is very good. The Annunciation of Death scene is emotive but steely of tone, an ideal combination. But the louder and higher passages, of which there are many, often grate, and there is little continuity between the these and the quieter passages. She has a kind of vibrato where the volume fluctuates rather than the pitch, and that can get wearing on the ear. Its a tough part, of course, and there are certainly inferior performances to this available elsewhere, but in a cast that is otherwise excellent, she is the one slightly weak link. Otherwise, this is a very fine Walküre. There is no shortage of competition, and even the Oehms label is currently engaged in another Ring Cycle project with Hamburg Opera. But like the Rhinegold before it, this Walküre has the particular advantage of having Sebastian Weigle at the podium. His measured approach isn't going to be to everybody's taste, but he is one of the few Wagner conductors working today who does something distinctive with the music. His control of the orchestra is ideal, but so too is his intuition for giving the singers the freedom they need. There are plenty of musical challenges ahead in the last two instalments, but Frankfurt Opera should be feeling confident that their conductor has what it takes.